Tract H is enveloped by eastern North Carolina high ground wilderness, with one certainty - a wide variety of trees. The image above, made December 2, 2017, is an aerial view (from about 300' above Tract H) of parts of Lot #3 and Lot #4, and what surrounds it all - more outstanding forest. Forest and tails, a planned 26.3 miles of them as the natural connective tissue to acres of big and wild pond views like this one: Below. 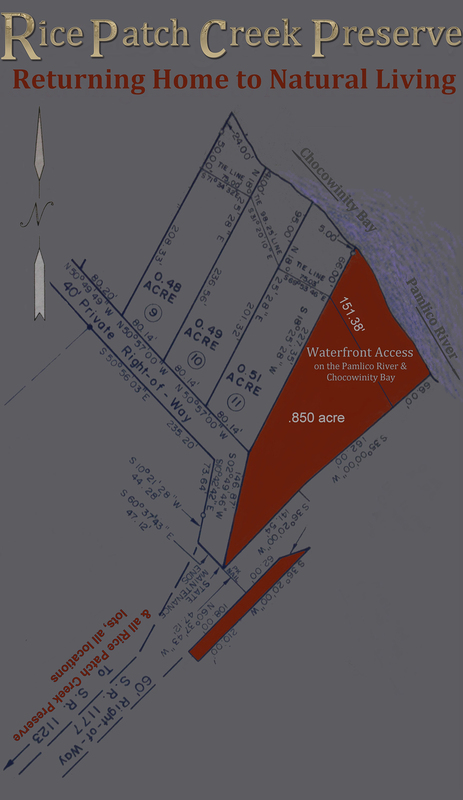 Large waterfront access lot shown here, which is deeded with every lot of all residential lots sold in this expansive project: Below. Click the image to get the fully expandable map. Follow the provided link to this post: Collection Place for all Preserves Tracts for Sale ; scroll down tho the bottom of the page, where you will find a locational map for the property, including every plot and tract that we are currently offering.